What you see is the beautiful array of produce, the shelves of spices and carefully chosen packaged foods, the case of chilled meat and seafood, the coffee bar, the tables, the cookies and brownies and scones. What you feel is the welcoming ambience provided by a sunny, attractive space and the pleasant vibe of pleased customers strolling through the aisles or at table or couch to enjoy a meal or sip some of the home-roasted coffee. 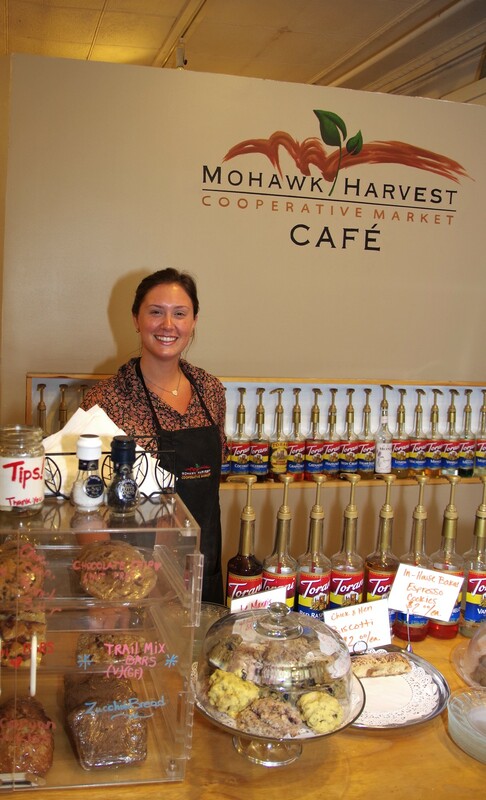 What it means is that, as it celebrates its eighth anniversary, Mohawk Harvest Cooperative Market continues to thrive. And its renewed growth is the vision of a new manager, Gianna DeLilli, who took over that position in May but knows well the food co-op in downtown Gloversville (Fulton County, NY) after two years as an employee. To that end, she attends the twice-a-week Mohawk Valley Produce Auction in Fort Plain (Montgomery County, NY), where area farmers wholesale their goods – and she’s been working to build relationships with the farmers themselves, buying directly for the store and also buying with an eye to wholesaling some of the local bounty to restaurants herself. There’s a new logo for the place, and new paint has been strategically applied to harmonize with floor space and traffic flow. Antique wood floors and tin ceilings murmur the heritage of the building, which went up in 1881 to house the Kasson Opera House (now Glove Theater), among other retail outlets. 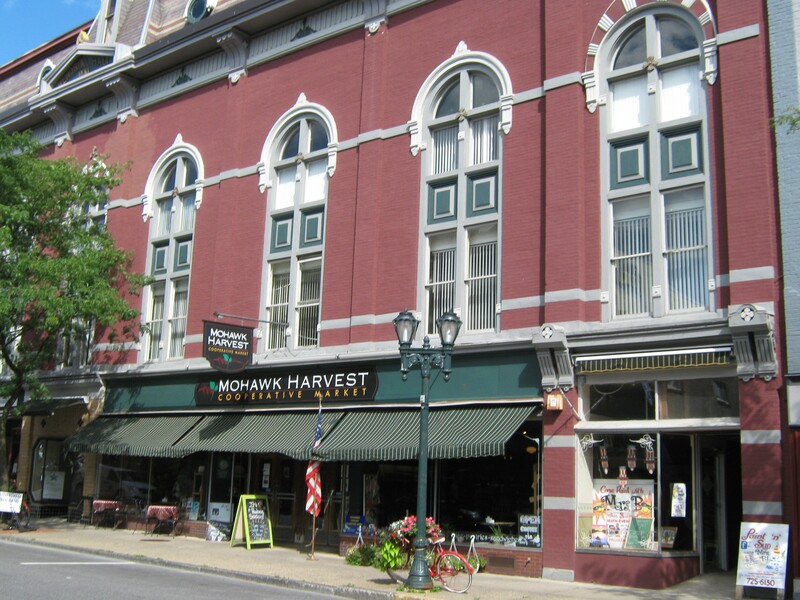 Now known as Schine Memorial Hall, the building continues to be a hub of Gloversville commerce and social activity. The Co-op opened in a smaller location across the street from its present one, in a city that’s seen its fortunes stagger since the decline of the glove-making industry over a half-century ago. Empty storefronts checkerboard Main Street, but the success of Mohawk Harvest and the revitalized Glove Theater are inspiring other business to test the downtown waters. 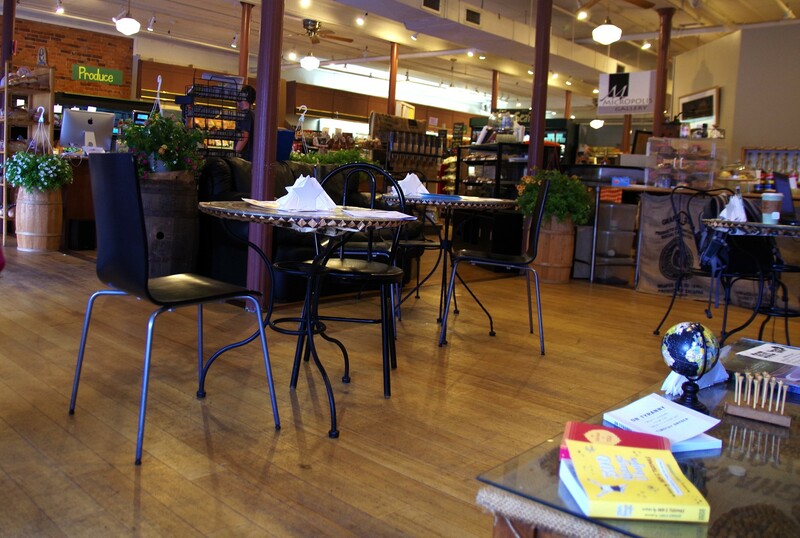 The café, at the front of the store, sports five tables and a pair of couches, with a self-serve coffee station. But there’s usually someone nearby to recommend a pastry or two, which beckon enticingly from a counter display. There’s a case of cookies and muffins from Gloversville-based Sugar Pearl, and other items, like biscotti, come from the Chick and Hen Baking Company, located north of the city in Bleecker. 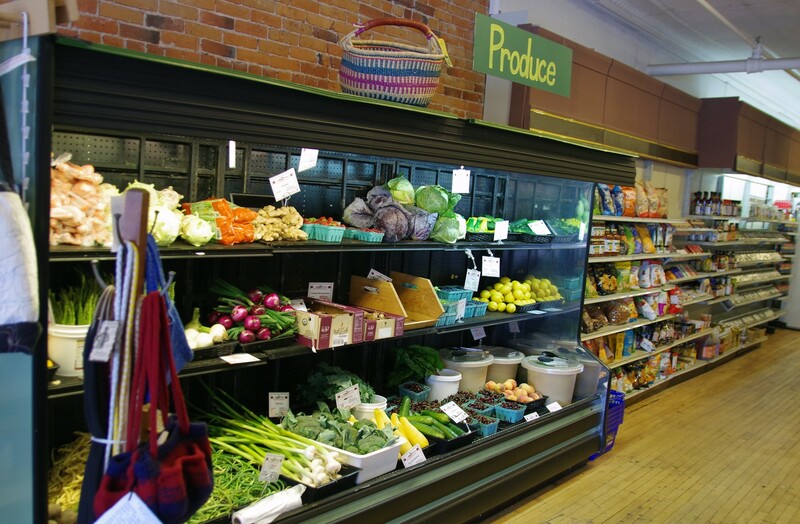 Fresh produce fills a case by the front of the store; beyond it is a you’ll-never-go-hungry array of chips, chocolates, spices, soaps (including the legendary Dr. Bronner’s), beans, bars, pasta, olive oil, grains, and nuts. 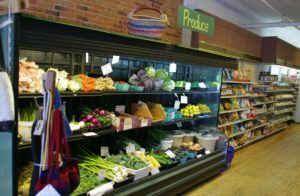 And there’s fresh locally raised meat (from Heather Ridge Farm) and a variety of fresh salads (chicken, cucumber, potato, macaroni – you get the idea). Frozen meats include lamb from Dutch Barn Farm in nearby Stone Arabia (which grows everything on the farm without using artificial fertilizers, pesticides or added hormones and has taken the NOFA Farmer’s Pledge), sausage from Kelley Meats, and pastured elk from Creek’s Edge farm, alongside a variety of beef cuts. Eggs, milk, and yogurt fill the dairy case, not far from shelves of local honey, jam, and fresh-ground peanut butter. The coffee selection has expanded, thanks to Kevin Chamberlain, whose roasting sessions can become cheerfully narrated excursions into his methodology, usually with generous samples. Sacks of beans proclaim Mexico, Peru, and Indonesia, among others, as the countries of origin, and the aromatic, crackling roasting process itself is as much of a sensory feast as the final brew. Chamberlain works full time at No. 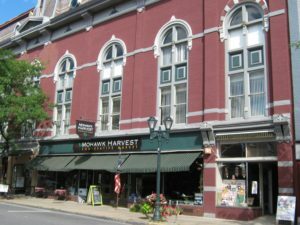 22 Bicycle Company in nearby Johnstown, but his expertise as a coffee roaster has put Mohawk Harvest on the map as a destination for coffee lovers. French presses are newly added, so when you’re ready to commit to a pot, that’s the optimal way to go. Alongside the various roasts – which includes a dark, delicious decaf – are variants like cappuccino, Americano, and different flavors of latte, including Mocha and French toast. All of the brews are also available iced. There’s also a selection of tea, black and herbal, served hot or iced. 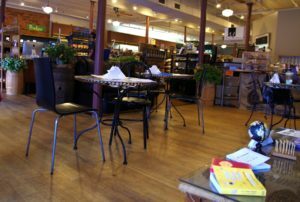 At the back of the store is a counter for more serious eating, where breakfast and lunch specials are offered daily alongside a changing selection of homemade soups. Recent menus have included specials like zucchini parmesan and a sandwich of salmon salad with spinach, alongside such regular offerings as a turkey Reuben, tuna and spinach sandwich, grilled cheese with roasted red peppers, bacon-spinach-tomato sandwich, and more. The turkey Reuben (one of my favorites) includes cheddar cheese and sweet-and-sour red cabbage on toasted panini bread. During a recent visit to celebrate the store’s anniversary, my wife and I enjoyed a pair of delicious brunch items. 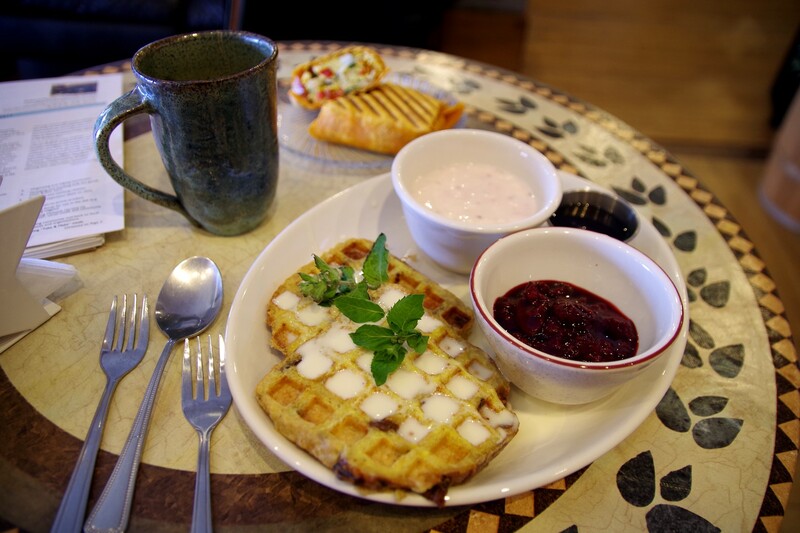 She had a breakfast wrap that contained egg, spinach, mushroom, and cheese, which combined well in terms both of flavor and sandwich texture; I opted for the special of walnut-studded waffles, served with real maple syrup, a fresh raspberry compote, and sweetened yogurt. 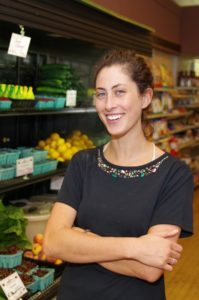 [Editor’s Note (FWB)-A couple years ago, we reported on the economic benefits to a local community when consumers patronize food co-operatives compared to conventional supermarkets, with local suppliers averaging 157 for food co-operatives verses 65 for conventional supermarkets. 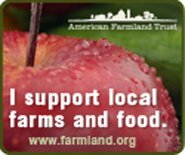 Also, food dollars spent on locally sourced products by food co-ops are much higher, by percentage of total dollars spent, than by conventional grocers. 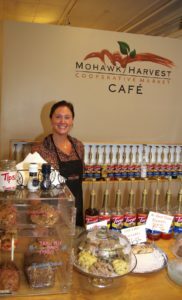 Many food co-operatives also engage their local communities in ways similar to Mohawk Harvest as described above. We’ve made it a point to include cafés located at food co-operatives in our dining directories, and would appreciate users of this website sending us information on any additional co-op cafés, not already included in our dining directories, which place a priority on sourcing ingredients from local growers/providers. Sign up for our posts, as they are published, to be sent directly to your inbox! Copyright © 2019 knowwhereyourfoodcomesfrom.com All Rights Reserved.